Reach for the Sky is a real life story about Douglas Bader, man who lost both of his legs in flying accident and still became one of the greatest pilots in the world. His story is inspiring in so many different ways. His journey through all the difficulties and his time in German prisons would be worth to read even without him losing both of his legs, but that makes it even more important. Douglas Bader gives important lesson to everyone about the willpower. He knew what he wanted and kept trying long enough to get his answers. Some might say he was stubborn, but I would say he was consistent. He did realize that some of the things became impossible to him, but he had to learn it himself and didn't let anyone to tell him that. That's the lesson we all should learn, we shouldn't let anyone else tell us what we can and what we can't do. 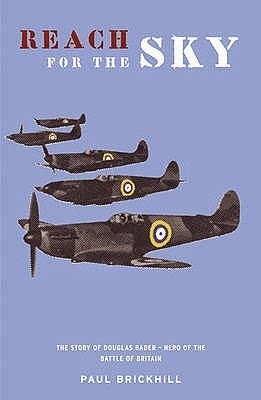 The Author, Paul Brickhill, is a pilot himself. That has given him a skill to describe flying quite comprehensively. Also Brickhill was a prisoner himself in German prisons, so the stories about escapes are really authentic and detailed. Story is good dive in to the World War II and to the incredible life of Douglas Bader. I haven't read many biographies, but I'm happy I read this one. I really enjoyed the book and I'm happy to recommend this book to everyone. It teaches about history, but also it teaches us about how important willpower and believing to your own skills is.